If you want results, call us. If you want peace of mind, call us. If you want representation who understands the hardship that has been thrust upon you, call us. Since 1979, the legal community, the courts and the insurance companies have known and respected us. We understand, when you’re looking for a personal injury attorney, you are looking for a seasoned attorney whom has seen it all and can handle anything. You want an attorney who will take the time to speak with you, who can handle your case as quickly as possible and get the maximum settlement or verdict recovery for your case. We know you want the best. Our reputation in California, Central California, Los Angeles, Ventura, Long Beach, Orange County, Riverside, San Bernardino, San Diego, San Francisco, Santa Clara, San Jose, Sacramento and Fresno speaks for itself. We are among the best California work injury and personal injury trial attorneys you can find. Ask around. We believe in the legal and legislative protection of injured people. We also believe we, as your San Diego work injury lawyers, should be part of the solution and not the problem. We believe that when you call our office, you should be called back the same day. We believe when you have a question or an immediate concern that you get an answer to your question and your concern is addressed. We believe in being involved your community. We believe that what we do is fight for you, to make your life better. We believe in making wrongs made against you right. We believe in consumer protection. We believe in the protection of your legal rights, your health and your safety. We believe in guiding you through this often complex and confusing legal process, allowing you time to heal and recuperate. We are here for the right reasons. We are here for you, our client. The San Diego work injury lawyers at DiMarco | Araujo | Montevideo provide a team of experienced attorneys, physicians, economists, vocational experts and accident reconstructionists all working together to prove and maximize your full and fair recovery from the insurance company, judge or jury. The work injury attorneys at DiMarco | Araujo | Montevideo are available to meet you in the comfort of your own home, immediately at the hospital or at our office. You can call us 24 hours a day by telephone or contact us via E-Mail. DiMarco | Araujo | Montevideo has been assisting Californians in Northern California, Central California and Southern California communities for over 30 years. Our number one priority is you, our client. 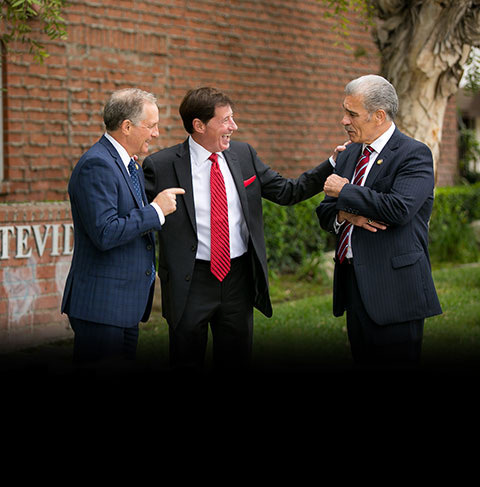 We have three principal partners: Jess J. Araujo, John A. Montevideo and Joel J. Thomas. John A. Montevideo is the 2009-2010 President-Elect and the 2010-2011 President of the statewide consumer protection group CAOC (Consumer Attorneys of California). Mr. Montevideo was inducted into the Hall of Fame of his law school. Jess Araujo is an internationally renowned public figure for the California Hispanic community. Joel Thomas is the lead firm’s lead workers’ compensation trial lawyer and the 2009-2010 President of the Orange County California Applicants Attorneys Association (CAAA). Additionally, our clients have the added security and benefit of representation from 8 experienced trial attorneys and 35 bilingual support staff. Our lawyers practice law all over California. We practice personal injury, workers’ compensation and work injury law in California, Central California, Los Angeles, Ventura, Long Beach, Orange County, Riverside, San Bernardino, San Diego, San Francisco, Santa Clara, San Jose, Sacramento and Fresno. We’re with you all the way. DiMarco | Araujo | Montevideo is AV Rated – the highest rating attorneys can have for ethical standards and legal ability voted by other lawyers and judges in the legal community. DiMarco | Araujo | Montevideo work injury lawyers are selected as Preeminent Lawyers by Martindale-Hubbell (less than 5% of all attorneys in the United States are selected). We have earned an A+ rating from the Better Business Bureau (BBB), the highest rating awarded to a law firm. As evidence of our strong reputation as work injury attorneys, DiMarco | Araujo | Montevideo lawyers are the exclusive work injury attorney recommendation by OCEA Labor Union (Orange County Employees Association). Additionally, California personal injury attorneys DiMarco | Araujo | Montevideo are the official legal counsel for the Mexican and El Salvadorian Consulates of Orange County.